The Rhode Island Department of Transportation (RIDOT) is removing more than six million lbs. of steel and 2,700 cu. yds. 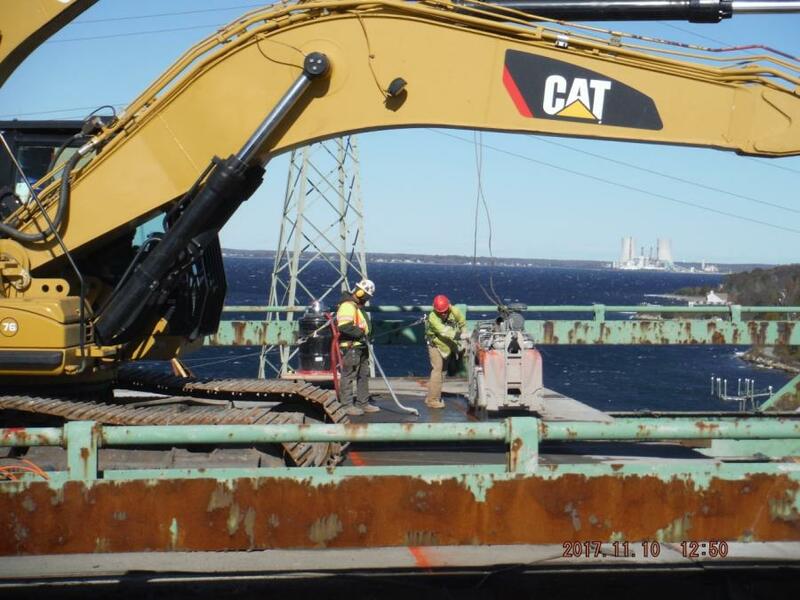 of concrete across 17 spans between the Sakonnet River Bridge’s piers, for a total of 2,178 ft.
As part of a two-phase process, construction crews in Portsmouth, R.I., are demolishing the old Sakonnet River Bridge one piece at a time. The Rhode Island Department of Transportation (RIDOT) is removing more than six million lbs. of steel and 2,700 cu. yds. of concrete across 17 spans between the bridge's piers, for a total of 2,178 ft. The long-overdue process removes the bridge from east to west. Residents along the shore will see the bridge slowly deconstructed over a period of several months. Crews are dismantling the bridge with great precision and attention to detail. The current total project cost is $15 million. Cost estimates for the next phase are being developed as part of the permitting process. The final outcome of what's allowed for demolition methods under the permit will affect the price. Officials hope to begin the second phase in 2019. This phase will address in-water and land-based substructure elements. 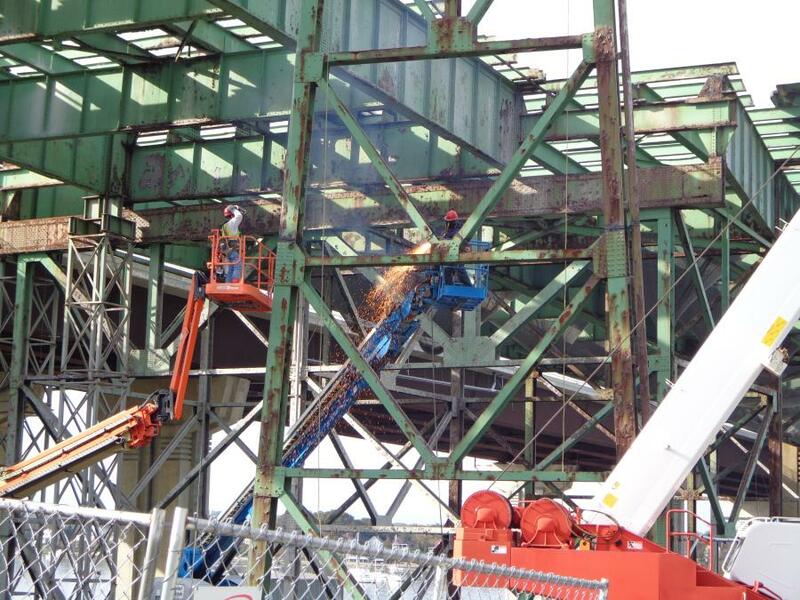 RIDOT has considered using controlled explosive demolition, as it did for a portion of the former railroad trestle adjacent to the old bridge, and for the old Jamestown Bridge. RIDOT intends to begin work on the second contract as soon as possible after the completion of the first phase. St. Martin said it was important to conduct a new engineering inspection of the bridge to ensure the safety of workers, and to make certain the equipment they are using can be adequately supported by the old bridge. The temporary closures of the channel on the Sakonnet River where it passes underneath the old Sakonnet River Bridge in Tiverton and Portsmouth also had to be carefully planned. Work on the first-phase demolition effort began late last winter, and should be completed by summer 2018. 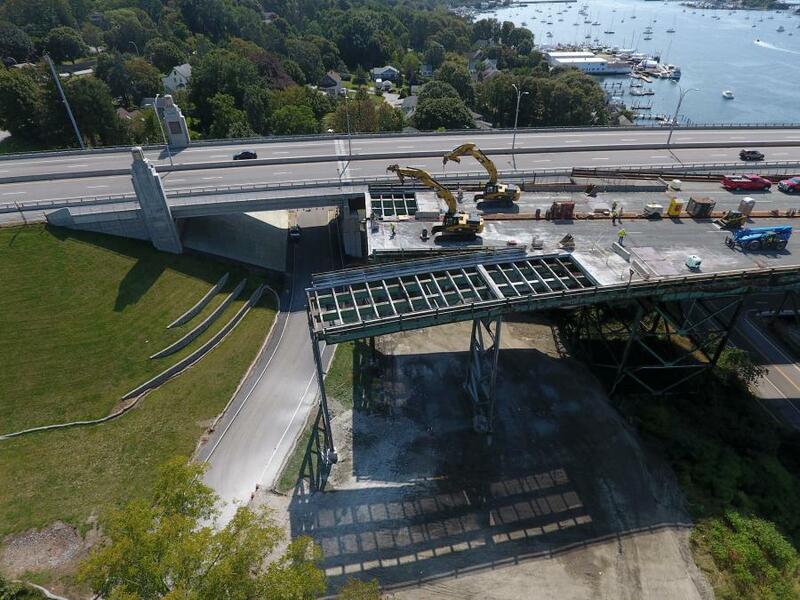 According to RIDOT project manager Jody Richards, “The biggest challenge was developing a plan to remove the bridge piece by piece, given the bridge's current condition. For example, steel plates were added to spread the load of construction equipment operating on the bridge. Additionally, the bridge's deck was removed in five-foot sections, one row across the width of the bridge at a time, to carefully unweight the bridge as evenly as possible. 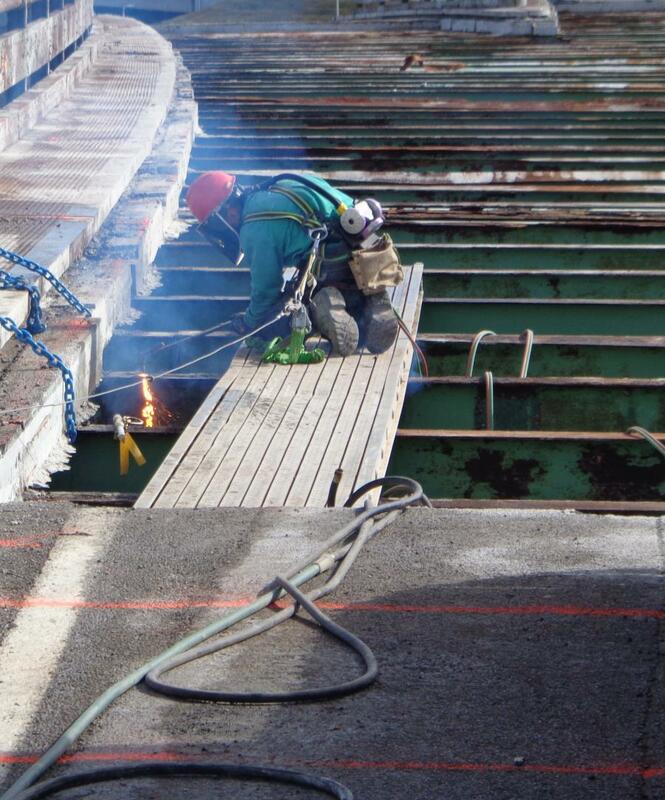 Work continues on removing the concrete deck slabs and structure steel members on the east side using two crews. The progression of deck removal is entering the area above the center navigation channel. Subsequently, RIDOT has closed the center channel for approximately one month. Another closure will be scheduled for late winter. Vessels will be unable to enter or pass through the channel under the bridge while the demolition occurs from 6 a.m. to 6 p.m, Monday through Saturday. The channel will be open all day Sundays. Demolishing the bridge has, understandably, required a great deal of coordination. An unexpected weather event had a dramatic impact on the tear down, as workers faced tsunami-like conditions. The elements may prove difficult looking ahead, as workers prepare for future high wind possibilities, along with heavy snow and icing. Lightning also could be a problem in the area, although not common in winter months. Crews have removed about 40 percent of the deck slab and two spans worth of structural steel, so far, and have completed all protective netting for debris and migratory birds. Small portions of the bridge had been removed as part of the contract to build the new bridge, as the footprints of the bridges overlapped slightly where they met the land on either side. This was more so on the Tiverton side, than Portsmouth. The most time-consuming part of the work is the deck removal that is now under way. Production is about 20 to 30 ft. per day. Main equipment used during construction includes several size cranes for steel superstructure removals. The work calls for a Liebherr LR1200 275-ton lattice boom crawler crane; a Liebherr LR1300 330-ton lattice boom crawler crane; a Liebherr LTM 1500 600-ton hydraulic truck crane; a Tadano/Mantis GTC 1200 130-ton telescoping boom hydraulic crane; a Tadano GR 1000 100-ton hydraulic rough terrain truck crane; and a Liebherr LTM 1130 130-ton hydraulic truck crane. Three Caterpillar 321DLCRs are needed for deck removal, incidental steel removals from atop the bridge deck and truck loading tasks. A Lull 1044C 10,000-lb. telescoping rough terrain fork lift also is being utilized during ongoing work, as well as two Husqvarna FS 7000-30s 75-hp. 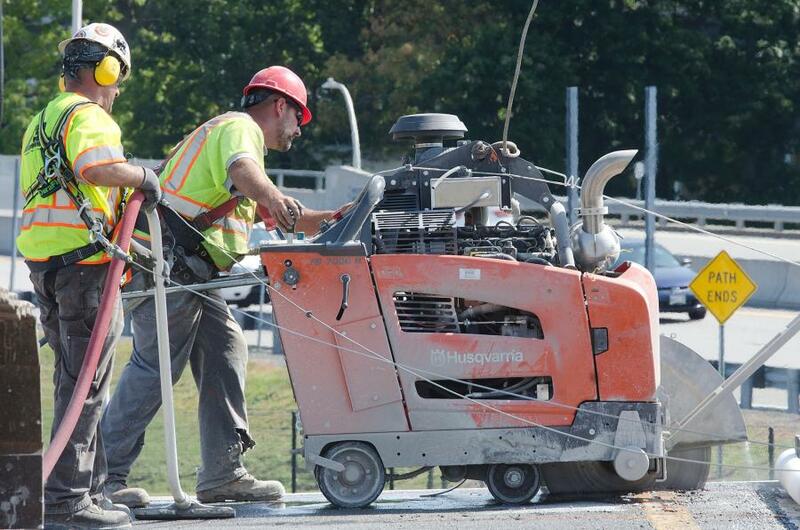 diesel driven concrete saws, Core-Cut DPCC 6573-30 75-hp. diesel driven concrete saws and a Caterpillar 226B skid steer loader. The water work, meanwhile, requires three spud barges, sectional barge platforms and a twin screw push boat. S & R Corporation of Lowell, Mass., is the general contractor on the project, while Commonwealth Engineers & Consultants Inc. of Providence is serving as the engineering firm. In 2003, RIDOT formally announced plans for the $120 million replacement bridge to be built just south of the existing bridge. Groundbreaking for the structure took place in April 2009, with the new bridge officially opening three-and-a-half years later.